It’s Friday Night of The FOG Live this Friday Oct 2nd at 7:00PM. The wine is heavenly the beer is cold and the music IS outa sight. We have a great line up of tapas and appies. We have the world renowned(not reviled) true Master of Ceremonies Marcel Morneau. Richard Knox is coming back to do it again..yeah!..Come listen to him! Hopefully Aimee, Sera, Rolly, Corrie and Steph will be back…and so will YOU!!! Bring your music , your instrument and your voice and become part of the night sounds. We crank up the music shortly after 7:00. The music is huge…Tons of talent…all we need is you! . We are licensed. We have beer, wine, coffees with a kick and our usual great gelato and snacks, sweet treats and of course…our great host Marcel!. 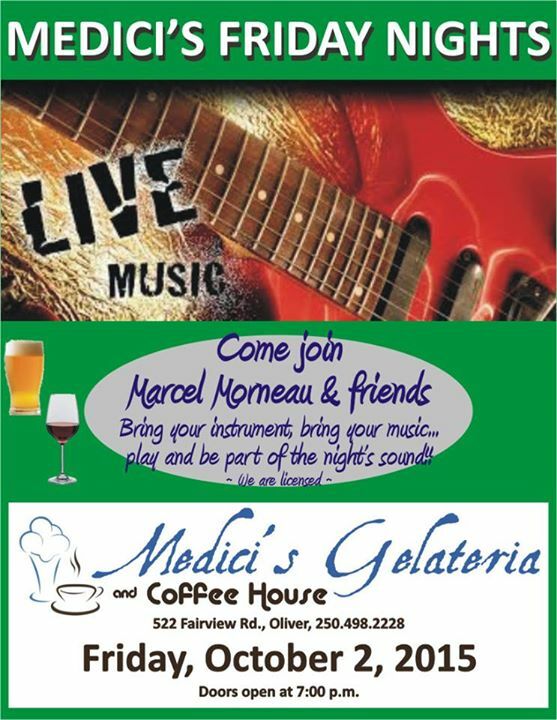 Medici’s this Oct 2nd at 7:00 PM. 522 Fairview Road. 250-498-2228.